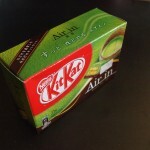 Review: “Air in” Green Tea Kit Kats | Oyatsu Break! 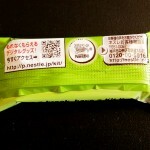 On the day I left Japan on my last trip, the gods at Nestle smiled upon me and released 2 brand new Kit Kat flavours… Well they weren’t so much new ‘flavours’ as entirely new sorts of Kit Kats. 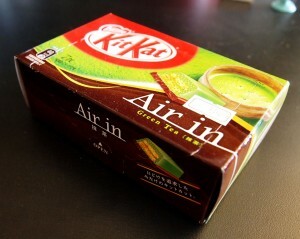 “Air in” is basically a Kit Kat crossed with an Aero bar (for my Canadian and British readers) or a “Mirage” bar (for the Americans). 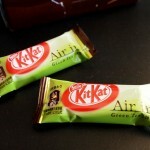 Essentially, the chocolate coating is now infused with tiny bubbles of air, to give the Kit Kats an effervescent feeling… it’s great in Aero bars, and Kit Kat has had a lot of success with effervesence in the past, in their soda-pop bars, so I’m looking forward to this. I like the overall design, it’s very organic feeling, and the combination of the green backdrop (actually a super-close-up photo of grains of green tea) with the chocolate-coloured accent is indicative of the overall style of the Kit Kat, green tea on top with a chocolate base–clever! 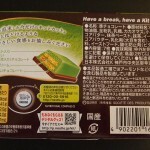 The photo of the frothy cup of green tea looks appealing, and I think that the Kit Kat people have achieved the feelings of sophistication they were going for with both the English and Japanese fonts on the box. 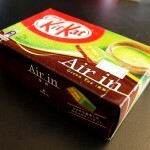 “Air in” is all kinds of sharp serifs. Scent: Definitely didn’t leap out at me. Getting in close, it mostly smells like milk chocolate, owing to the base. There is a faint scent of green tea, but I’ve had quite a few different matcha/green tea Kit Kats in my day and this is easily the weakest scent of any of them. A little surprising because usually the scents are really bright, even when the flavour isn’t. 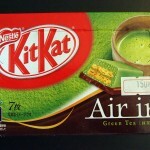 Taste: Perhaps unsurprisingly after smelling them, the green tea taste seems really dialed back here. I almost can’t taste it at all… I actually find that a little worrying. After a quick swish of water, I go back for seconds and just the green tea portion this time, and yeah, the green tea flavour is really, really weak up front. 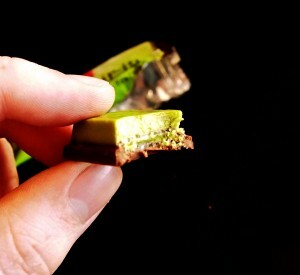 The aftertaste is a lot stronger, but would be totally lost if I had tried the milk chocolate bit at the same time. As for the bubbles? They’re almost not worth being there. I mean, the package shows great big bubbles of air in the chocolate, comparable to an Aero bar, but up close the bubbles are tiny, and they make no impression on me at all for taste or texture. Verdict: Really surprisingly disappointing! 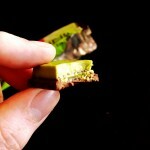 I had hopes for the combination of green tea with milk chocolate, and for a unique new texture… Instead the flavours were barely present, and the texture effect was almost totally lost on me. 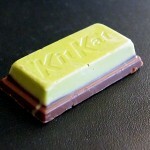 This could have been the dawn of a brand new Kit Kat, and instead it’s an evolutionary dead-end. That looks amazing! 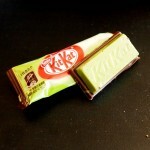 I’ve seen loads but i have yet to see a duel layer kitkat like this! Too bad about the actual resulting taste but it seemed like such a good idea. It is really neat looking, and I’ll share one with you next time I see you. Maybe I’m crazy? 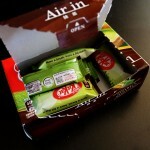 Pingback: » Review: “Air-In” Kit Kat White Oyatsu Break!